Revealed to the public in 1994, the IX-529 Sea Shadow was built for the US Navy in 1985 to experiment with seagoing stealth technology. 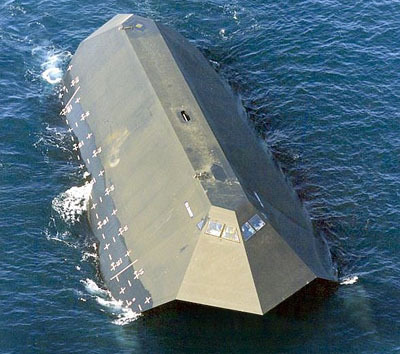 In addition to testing it's stealth characteristics, the Sea Shadow was also used to assess the feasibility of a minimal crew compliment, backed up by automated systems. Sea Shadow was a joint venture created by the Defense Advanced Research Projects Agency (DARPA), the U.S. Navy and Lockheed. Sea Shadow was developed at Lockheed's Redwood City, California facility, inside the Hughes Mining Barge, which functioned as a floating dry-dock during construction and testing. IX-529 Sea Shadow has a SWATH hull design which allows it to operate in very rough seas. Below the water are submerged twin hulls, each with a propeller, aft stabilizer, and inboard forward canard. The visible portion of the Sea Shadow is connected to the hulls via the two angled struts. Inside Sea Shadow there are only 12 bunks, and the kitchen comprises of one small microwave oven, a refrigerator and table. 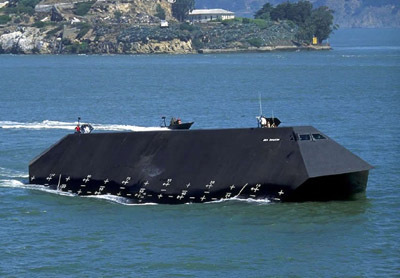 Designed as a test ship, the Sea Shadow is not mission capable, although it is a fully registered US Navy vessel.